Becoming a teacher is one of the greatest choices for a profession due to its rewarding nature. You will be able to impact the lives of countless students and families throughout your career. If you desire to teach in the state of New Hampshire, the following steps will help you. The first step you must take is answering a simple yet challenging question: Who is it that you want to teach? Would you like to teach high school or middle school students? Children with special needs? Perhaps you prefer elementary-aged children. The answer to this question will determine the type of teaching certification you will need to work towards. The New Hampshire Department of Education has information about school districts, teachers, and students in the in the state. If you desire to teach professionally in New Hampshire, you must hold a minimum of a Bachelor's Degree from an accredited college or university. In addition, candidates must complete a teacher preparation program. Those who decide to take the path of becoming a teacher early on have the ability to complete a blended or joint program. A joint program essentially blends together all of the requirements needed for a Bachelor's Degree as well as a teacher preparation program. A teacher preparation program will focus on strengthening your ability to instruct the level or subject you want to teach. As a teacher in New Hampshire, you are required by the state to hold teaching certification, which can be earned once you complete an educator preparation program. It is important that the teacher preparation program you complete is accredited. Teacher education programs in New Hampshire equip pre-service teachers with the skills to become effective educators. The programs focus on a set curriculum for pre-service teachers and fieldwork. You will take classes about varying pedagogical practices, teaching methods, differentiated instruction, lesson plan design, technology integration, and more. In addition to your experience as a student at your institution, you will be required to participate in field observations, student teaching, and possibly and internship. The exact requirements vary from program to program. Successful student teaching usually includes working with a mentor teacher to create and implement lesson plans, often writing reflections and putting together a portfolio in order to show your successes in the classroom. If you already hold a Bachelor's Degree in a field unrelated to education, you can go through a post-baccalaureate or alternate teacher preparation program. Many schools even offer joint Master's Degree and certificates of teaching programs. There are several alternative routes you can take to become an educator in New Hampshire as well. 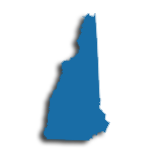 New Hampshire has reciprocity agreements and accepts applicants from other states as long as the candidate graduated from an approved state program, or has been employed as a certified teacher for at least three years out of the last seven years, or has completed an alternative certification program in another state. Another alternative route to becoming a teacher in New Hampshire is for candidates who hold a Bachelor's Degree, but have no teacher training. For this route, you must have an overall GPA of at least 2.5 and at least 30 credits in the area you wish to pursue. You will need to form a partnership with a local school district who is willing to assume the responsibility for training and supervising you. With this route, you can attain certification in elementary and secondary teaching areas while fulfilling your requirements. Next, you must pass some tests. All teaching candidates for initial New Hampshire certification must demonstrate competence in the basic skills of reading, mathematics, and writing. This can be fulfilled by passing the Praxis CORE Academic Skills for Educators Test. In addition, you will need to pass a subject matter competency test. This can be fulfilled by taking the Praxis II test. This test measures knowledge of specific subjects that K-12 educators teach. It also assesses general and subject-specific teaching skills. The New Hampshire Department of Education also accepts tests mandated by other State Departments of Education that are comparable to Praxis I and II. Some schools may require some or all of these tests to be taken before acceptance into the teacher preparation program. Ask a program representative or advisor for specific requirements. New Hampshire's Department of Education ask that applicants provide the following when applying for certification. After completing the steps, you will be ready to teach in New Hampshire as a certified educator! New Hampshire is committed to helping educators meet the educational needs of all students. With that said, what better state to become a teacher in? While education growth is keeping pace with national job growth, there is still a need in New Hampshire for certified and impassioned individuals to teach the young people of the state. Particularly in areas of English, math, science, and special education, new candidates in the state are easily welcome. In order to facilitate the application process, the state uses a number of websites to advertise relevant job postings: National Education Association - New Hampshire, New Hampshire School Administrators Association, and New Hampshire Association of School Principals. Teachers are required in most states to join a labor union upon being hired and New Hampshire is no different. Both the National Education Association (NEA-NH) and the American Federation of Teachers (AFT-NH) have active chapters in the state whose purpose is to support and enhance the professional lives of their members. Finally, retired teachers are eligible for pension funds through the New Hampshire Retirement System (NHRS). The NHRS requires mandatory contributions while in active employment status. The NHRS supplies disability benefits and survivor pension options as well. Candidates may also consider employment with one of the state's 360 private schools. The excellent student to teacher ratio of 9:1 is exciting from a classroom perspective. Small group instruction allows teachers to more easily differentiate instruction to meet the needs of all students. Teachers should be advised that compensation, vacation, and career advancement norms may differ from the public sector. The table below lists the number of public school teachers in New Hampshire by grade level during the 2012-2013 school year. There are more than 260 private schools with an estimated 2,400 private school teachers in New Hampshire. The table below details the number of teachers by grade level during the 2011-2012 school year. Teachers, support staff, and administrators throughout the United States have built a strong culture of continual self-improvement. Ongoing, relevant, and high-quality professional development has been proven to increase student academic achievement and overall educator satisfaction. Additionally, teachers who participate in professional development more often tend to achieve higher salary and career goals. Professional development offerings often focus around Common Core Standards, but can also include classroom strategies for teaching special populations, communication and administration, evaluation and assessment, and more. In New Hampshire, the state Department of Education values a collaborative approach to improving teacher practice and thus has a broad scope of acceptable activities that teachers may engage in. Professional development activities may include: action research, college courses, serving on committees with a variety of short- and long-term commitments, engaging in curriculum or program development, colleague-verified observations, peer-coaching or mentoring, professional reading, independent research, collaborative study groups, travel, attending workshops and conferences, and writing professional articles. Teachers seeking clarification for any of these means of improving their practice are encouraged to bring their questions to their school administrators. Although a master's degree isn't a requirement in New Hampshire, for teachers serious about advancing the teaching profession, and their own careers, it's the obvious choice. Earn a master's degree, either in instruction or in your subject, and you'll not only position yourself for more opportunities and better pay, you'll also meet the continuing education requirements for one licensure cycle. You'll be able to advance from your initial Beginner Educator Certificate to the Experienced Educator Certificate after teaching for three years. The three-year Experienced Educator Certificate is then renewed after you successfully complete at least 75 continuing education units (CEUs). While there are many ways you can satisfy the continuing education requirements for renewal, pursue your master's degree and you'll meet renewal requirements for one licensure cycle after completing just two courses (1 semester hour = 15 CEUs). Your master's degree also equates to a bigger paycheck in New Hampshire. Statistics compiled by the New Hampshire Department of Education reveal that in all districts, teachers with a master's earned more than their bachelor's-prepared peers in 2016-17. For example, teachers in the Contoocook Valley School District earned a minimum salary of $34,850, while those with a master's degree earned a minimum of $38,233. Similarly, teachers in the Hooksett School District earned a minimum annual salary of $35,438, while those with a master's degree earned a minimum of $38,730.